Peggi Kroll-Roberts, A Nap on the Beach, oil, 12" x 12"
Sometime in the middle of the Laguna Plein Air Painting Invitational competition last summer, Peggi Kroll-Roberts was attempting to paint her children and their friends on Blue Bird Beach. The young teens were restless, though, so she eventually recruited her sister, Tami, to pose for her instead. “I knew she could sit still for an hour,” Kroll-Roberts says. Several months later the up-and-coming painter was in the winner’s circle again. This time Kroll-Roberts won first place in the American Impressionist Society Juried Exhibition, held in October at William Lester Gallery in Point Reyes Station, CA. 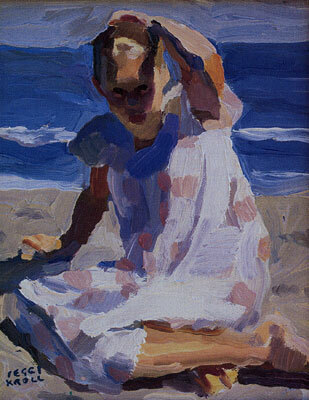 Beach Day, her winning painting, depicts her youngest daughter sitting on the beach wearing a romantic white cotton dress. Peggi Kroll-Roberts, La Jolla Beach, oil, 8" x 10"
As she notes, these two recent awards are her first top honors at prestigious competitions. Though she is confident in her work, she says, the awards are still a surprise. But one soon learns that her success is hardly shocking – Kroll-Roberts has been working diligently at her craft for three decades. Her formal art career began when she entered Pasadena’s Art Center College of Design in the 1970s to study illustration. After several semesters, though, she left to earn some money. Soon she landed a position as a fashion illustrator at an Arizona department store and moved to the Phoenix area, where she drew oodles of wigs, dresses, shoes and purses. After several years her wanderlust propelled her to a similar position in Wisconsin, where she continued to work under deadline pressure. She worked at the ad agency for four years, during which time she married another Southern California illustrator, Ray Roberts. After their first child was born in 1985, the couple decided to move to Scottsdale, AZ, because they wanted to raise their family outside Los Angeles. 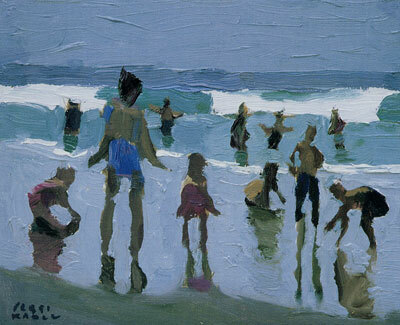 Peggi Kroll-Roberts, Beach Day, oil, 10" x 8"
Kroll-Roberts was no stranger to Arizona. In addition to working there briefly after art school, she had grown up in a small town near Phoenix. Her mother was a much-in-demand fashion illustrator at a Phoenix department store. As Kroll-Roberts’ own family grew, her mother gave her what she considers incredibly valuable advice: “Don’t quit working.” She listened intently and began to carve out time for both her art and her children. Back then she painted fast and furious, knowing she would get interrupted often. Her years of working quickly to meet deadlines for department stores and ad agencies came in handy. And as long as the poses were short, she says, she always had an endless supply of models. Bribes of a couple of dollars here and there didn’t hurt, either. Although she paints landscapes and still-lifes when the subject matter moves her, today Kroll-Roberts is known primarily for her figurative renderings. 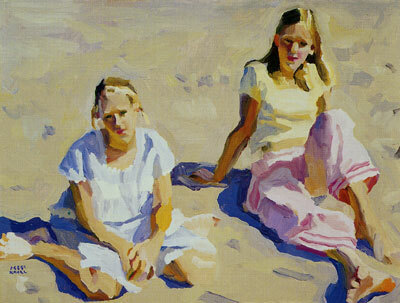 Children cavort in the sand or splash in the ocean; the scenes are saturated with intense color and golden light. “I always knew my emphasis would be on the figure,” she says. “I loved fashion illustration. And I was always more excited to draw a figure than a show.” Her tight, realistic illustrations have given way to a looser style characterized by swirling, energetic brushstrokes. Peggi Kroll-Roberts, Mary and Ali, oil, 18" x 24"
These days she and her family make their home in a small town in the foothills of the California Sierras. They moved to a modest ranch there in 1997, again because they thought the wide-open spaces and wilderness would be a great place for the children, Kroll-Roberts says. Besides the family’s three teens, the ranch is home to two dogs, Lucy and Lucky, five cats, one horse, and a chicken. Kroll-Roberts and her husband, who is known for his evocative landscape paintings, share a studio in a converted warehouse. They each have one side of the room, which is divided by a sitting area and a wood stove. Kroll-Roberts muses that after all these years, she still has to bribe her children to pose for her. In fact, the situation has grown worse, she jokes. “I find that a 15-year-old’s attention span is even shorter than a 2-year-old’s. Plus they charge a lot more,” she says with a laugh. Her goal for the future is simple – to paint larger. “As the children have become more independent, I’m painting bigger because there are fewer interruptions,” she says. 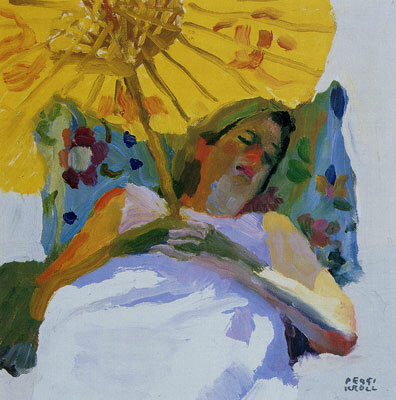 A fan of the San Francisco Bay area figurative school, she notes that she may adopt a more abstract style in the future. But for now, one thing drives her work and her choice of subject matter, whether it’s her children or a still life of lipstick tubes on a dresser: “I have to believe in what I’m painting,” she says. “I don’t paint anything I don’t love or have some kind of tie to.